Even faced with the risen Lord the disciples are still struggling to believe what they can see, hear and touch. The hypothesis that somehow the disciples came up with the resurrection stories from their faith in the resurrection does not hold up – what is revealed here is that the disciples struggled to have faith; faith was born not from themselves but from encountering the risen Lord and grew by grace. The risen Lord shows that He is the same person they knew by showing them His wounds. Here was the same body that had been crucified two days earlier. So not only was His body missing from the tomb, but now they can see the body with its wounds. So the evidence that He had risen is incontrovertible for the disciples. Of course there is something altogether different about Him too! He is not a vision, nor a ghost. He is physically there. To demonstrate His physicality He asks for something to eat, and they offer Him broiled fish. Ghosts or visions do not eat. So the picture is building of what the nature of the resurrection is. 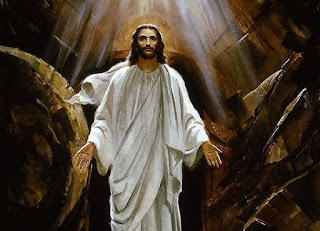 The resurrected Lord is physically present with the body that was crucified. The risen Lord talks and eats. Together with this is the fact that He can appear to various people in different places (outside the tomb, on the road to Emmaus, then in a locked room). He seems no longer subject to the limitations of time, space and the laws of nature. He reveals therefore what His glorified body is like, and thereby shows what our resurrected and glorified bodies will be like. Just as He had done for the disciples on the road to Emmaus, so He does for the Apostles. He opens their minds to the meaning of Scripture. So also for us, if we are to understand the Scriptures we must allow Christ to teach us by the Holy Spirit through the Church’s teaching authority (we cannot hope that personal interpretation will allow us to understand the Scriptures rightly!). Finally our Lord commissions the Apostles to go and preach repentance and salvation to all people and nations. The Church dispenses the blessings of the New Covenant through the preaching of the gospel and the administration of the sacraments (see Mt 28:19-20 ‘baptism’, Jn 20:23 ‘confession’). The Lord wants the fruit of His passion, death and resurrection to be shared with all people that they may turn away from the fallen life and through the grace of Christ live the risen life in Him. The capacity to do that comes through baptism, and our repeated failures to rise to the new life are rectified through the Sacrament of Penance. Through the Eucharist (if we receive it in a state of grace) our lives are increasingly ordered to the risen life.